The CONSUMAT® modular, controlled air incinerator uses two chambers for the controlled air incineration process; the primary (or lower) chamber and the secondary (or upper) chamber. The process of each chamber is controlled independently to ensure efficient waste processing in the lower chamber and complete combustion of flue gases in the upper chamber. A CONSUMAT® modular, controlled air incinerator is comprised of a refractory-lined combustion chamber (no grate is required) into which waste is loaded. Air is supplied to this chamber at a rate less than that required for complete combustion. The waste is initially ignited by an auxiliary burner and undergoes essentially a gasification / pyrolysis process. For normal wastes the reaction will proceed without the need for additional fuel. Waste decomposes under quiescent conditions, therefore carry over of particulate matter is minimized. The partial combustion products pass into an afterburning secondary chamber, which is mounted immediately above the main combustion chamber. The gases are mixed with additional air at an increased temperature to ensure successful burn out of particulate matter to eliminate smoke. This chamber (or chambers) is designed to retain the combustion gases at 1800°F with retention time based on waste composition and regulatory guidelines. Air for combustion is supplied to the lower and upper chambers by independent centrifugal blowers. The rate of air supply to both chambers is automatically controlled to provide correct combustion conditions for a given application. The controls will automatically shut the machine down to a safe condition after the last charge of the day has been loaded and completely burned. The lower chamber operates at low interior gas velocities under controlled temperature conditions. 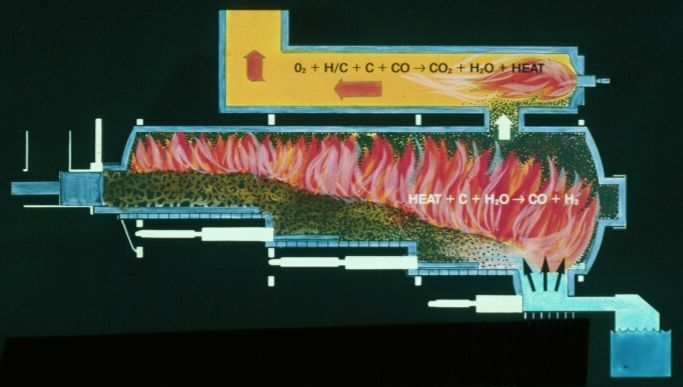 The amount of heat released from the burning waste is controlled by limiting the air added into the lower chamber to less than what is required for complete combustion of the waste. (Hence, the system is sometimes called "starved-air" incineration). Underfire air is introduced into the lower chamber through air holes located under the waste. The heat released is enough to keep the waste burning for partial combustion. The combustion gases then pass into the upper chamber(s) through a turbulent mixing zone where ignition takes place and additional air is provided to complete the oxidation reactions. Remaining in the lower chamber are the non-combustibles, such as metal and glass, and carbonous residue from the burned material. The carbonous residue is further oxidized by the incoming air while rendering the residue sterile by subjecting the non-combustibles to high temperatures. The result is an oxidized ash product with sterile non-combustibles. Controlling the lower chamber gas velocity is an important factor in limiting pollution. The gases flowing from the lower chamber are a result of the interaction of the air with the waste during the controlled burning process. Both the quantity and velocity of gas produced vary according to chamber temperature conditions and the type of waste being burned. The integrated controls for the upper and lower chamber(s) minimize peaking activity for controlling pollution, as well as for an efficient energy recovery system. The upper chamber completes the oxidation reactions of the combustible products. In order to accomplish this, upper chamber conditions must be controlled within an acceptable range. The automatic air and fuel modulation control system maintains the required conditions by controlling the upper chamber air input and burner fuel input. This modulated control system balances the upper chamber combustion air and upper chamber burner gas to maintain the required temperature to ensure complete combustion. Efficient mixing of combustion air is accomplished through the proven design of the CONSUMAT® modular, controlled air system. Copyright © 2004 Consutech Systems, LLC. All rights reserved.